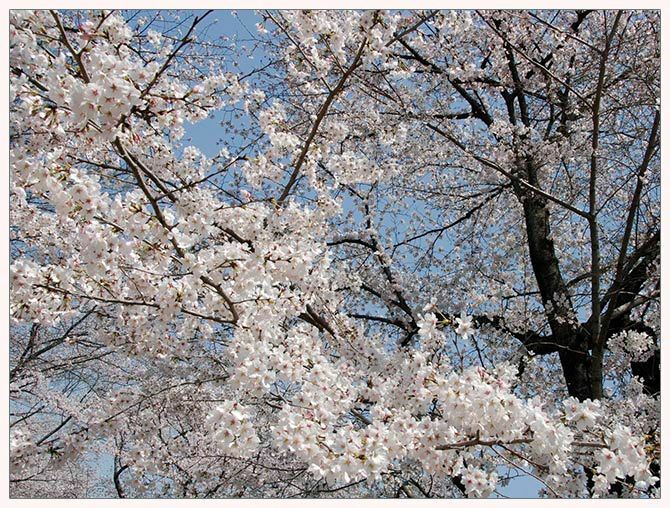 It's a lackluster cherry-blossom season this year in that for whatever reason, the trees are not blossoming all at once but each at their own pace. Looking out the living-room window, for example, I see one tree that has been in full bloom for almost a week and the one right next to it just barely starting. Yesterday before going to the gym, Shimada-san and I stopped by a temple near the gym that's well known for its blossoms. It was quite nice. 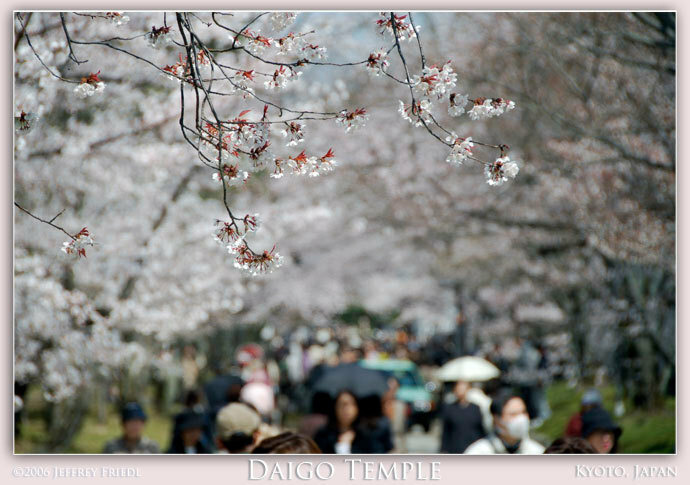 We strolled about on two long cherry-tree lined lanes, which sit outside the main temple area. (The two lanes intersect at the center of this map.) Most of the trees were in some stage of bloom. In the picture above, which is looking north up one of the lanes, you can see the trees on the right (background and out of focus) are not as fully in bloom as those on the left. The foreground in-focus branch is even less in bloom. But still, it was beautiful. It was crowded, which usually means ugly, but in this case it wasn't. Perhaps because it's on a temple's grounds, no one was smoking, nor drinking, nor sitting on blue vinyl sheets eating smelly bento lunches. People were there to enjoy, and people did. I was there with my Nikon D200 and was not alone. There were a lot of very serious-looking SLR cameras, both digital and film. So, despite the crowds, the ambiance was relaxed and pleasant, and I enjoyed myself very much. All in all, I took about 250 photos yesterday (of blossoms and of Anthony getting a haircut), so now have the pressure that I have to go through them and process them. That'll take a while, and certainly be compounded by more photos today and tomorrow and so on, but I wanted to post at least one picture which captured the mood. I chose the one above because it shows the crowds, yet exudes a feeling of calm and beauty. It also gives a sense of depth: the white puffs just go on and on and on. The image above links to a higher-resolution version (1,600 × 1,200), which should be big enough for most desktops. If you need larger, let me know (the original is more than four times larger). I'm now using this as my desktop background, switching from the Katsunori Shimada photo at the top of this post, which I'd been using since the fall. 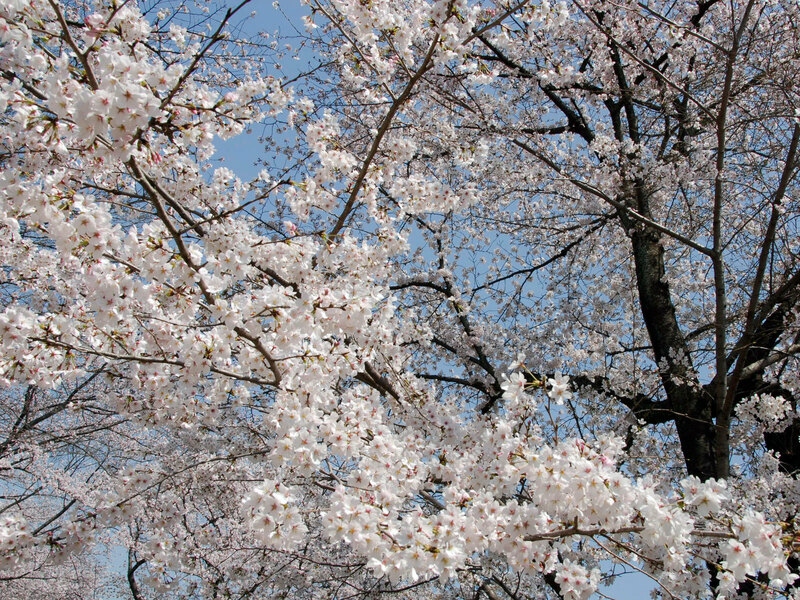 I'll probably switch back after a while, as I generally prefer less whiteness in my desktop background, but for now, it's all about the blossoms. UPDATE: more cherry-blossom backgrounds from a different trip. I’m giving the father of the groom speech at my son’s wedding next August – could I have your permission to use your pic as a background?